We sell lots and lots of battery operated light sets and window candles during the holiday season; and with these items in particular it is very important remove the batteries. Many of these items continue to go through daily cycle timers and, as a result, they will try to turn on and off while in storage. The result is that batteries get overly depleted and may start to corrode the battery compartments. Even if the decoration is turned off, batteries can still get depleted just sitting in the compartment. The results can be the same (as an item left ON) and 10 months later when we try to set up these decorations once again... we might be hassling with cleaning them up to restore them. 1) Remove batteries from anything being put in storage for an extended period of time. The longer you expect to store items and the more depleted you think the batteries already are, the more important it is to have them removed from the decoration. 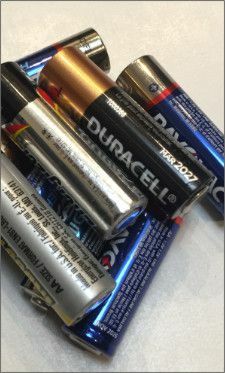 2) Store good batteries safely. We recommend storing batteries securely in their original packaging. If the original packaging is no more, then you can place a small piece of electrical tape over the + and - terminals. Doing so will prevent the battery from overheating if it improperly contacts other batteries or other conductors (ie. metal).